Larger, louder add-on beeper for StratoLogger Altimeters. No soldering necessary - just plug the cable into the StratoLogger's Audio port. The AEB amplifies all sounds (powerup settings, continuity beeps, post-flight readouts, and locator siren) by up to 26db. 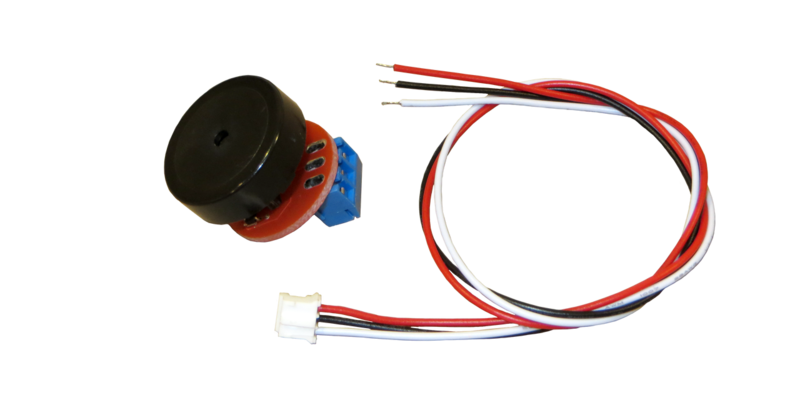 Assembly consists of a connecting cable, a small PCB with circuitry to amplify the StratoLogger's audio output, and a larger high efficiency piezo speaker. Minimal additional current drain (1 ma typical) on StratoLogger's battery. The PCB mounts to the inside of the av bay bulkhead and measures 0.9" diameter x 0.3" thick. The piezo speaker element mounts to the outside of the bulkhead and measures about 0.9" diameter by 0.3" (AEB4) or 0.5" (AEB2) thick. The AEB2 for StratoLoggerCF must be used with a current-revision StratoLoggerCF that has the Audio Connector option installed. It is not compatible with versions of the altimeter that do not have this connector. The AEB4 will work with all revisions of the StratoLogger SL100.